iHobby Expo is the main US hobby show, but for many years there has also been a specialist Toledo Collectors Toy Fair, in Ohio. This year the Toledo show coincided with the Sunday of iHobby, so Moebius was torn as to which to attend - so it did both. Frank Winspur, creator and CEO, was at the show in Chicago while colleague Dave Metzner was two states eastward. 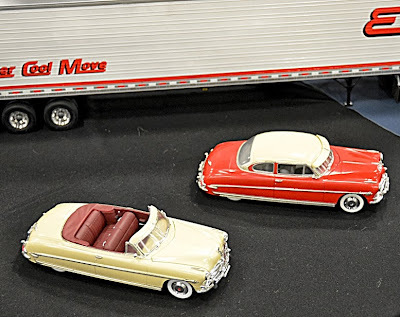 The split was primarily because Moebius, although known mainly for its range of science-fiction and horror models, has also turned its attention in recent years to car and truck models, such as the excellent 1:25 scale 1952 Hudson Hornet convertible and 1953 hardtop (above) and streamlined Art Deco-look International Lonestar and Prostar trucks. 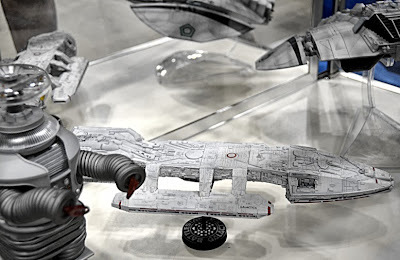 First though, what was at iHobby Expo 2013? 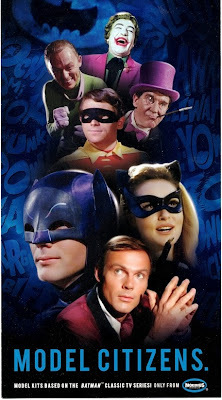 Here, Moebius revealed work on a whole range of 1:6 scale styrene figure kits from the original Batman TV series, not only with Adam West’s Batman, but also Robin, Catwoman, Riddler, Penguin and the Joker. These weren’t the only new figures. 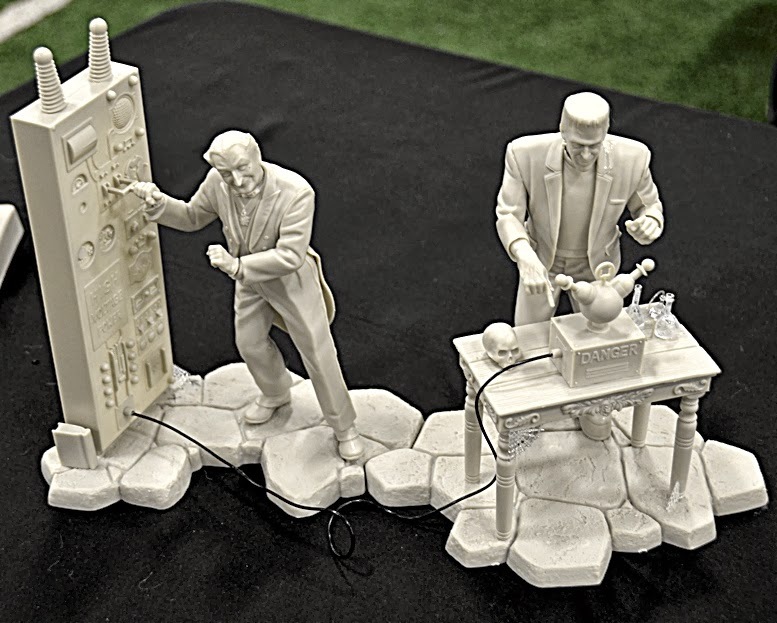 Herman and Grandpa Munster (test shot above) will be produced to 1:10 scale, somewhat larger than the Moebius 1:87 (H0) scale kit of their home at 1313 Mockingbird Lane. 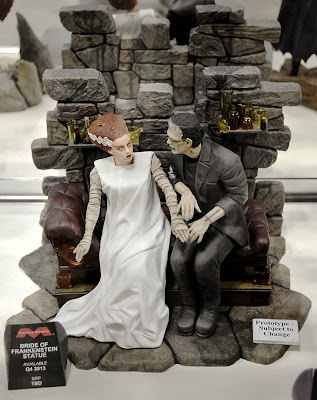 It’s the first time Herman and Grandpa have been produced in plastic since the original Aurora Munsters Family Living Room, a kit since retooled and reissued to 1:16 scale by Polar Lights. From ‘Superman: Man of Steel’ comes a new kit of Superman, and - another first - General Zod. 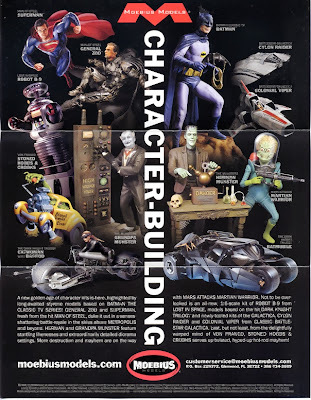 The last time the big-brained Martians from ‘Mars Attacks’ made a noisy and violent appearance, it was via the Screamin’ vinyl and resin kits. 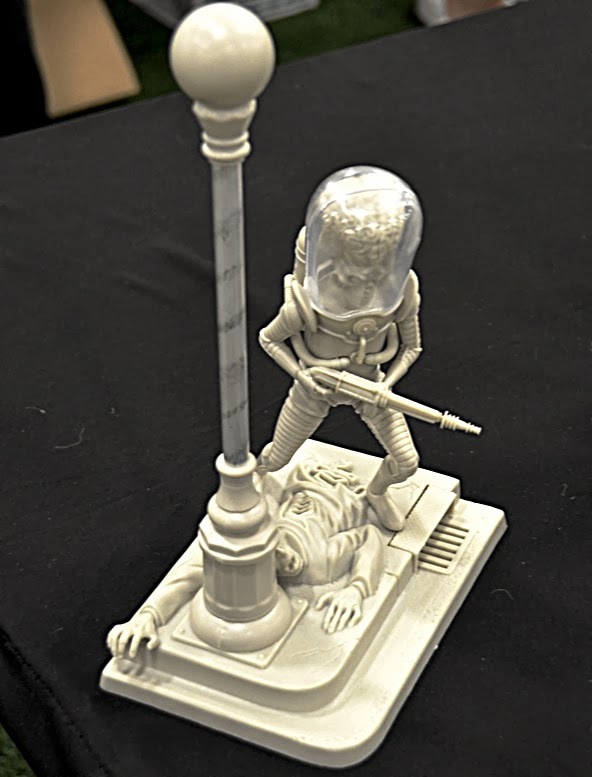 Now, Moebius will be reliving those not-so-friendly aliens with a new series of injection-styrene kits, test shot shown above. Shades of the Monogram Battlestar Galactica, but the new Moebius version (above) has far more detail. 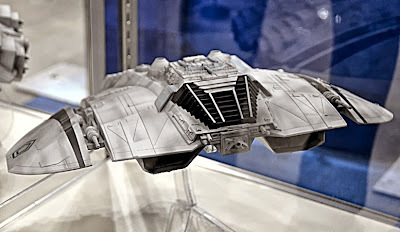 The 1:32 scale Cylon Raider (below) has a span of some 400mm (15.5 in). 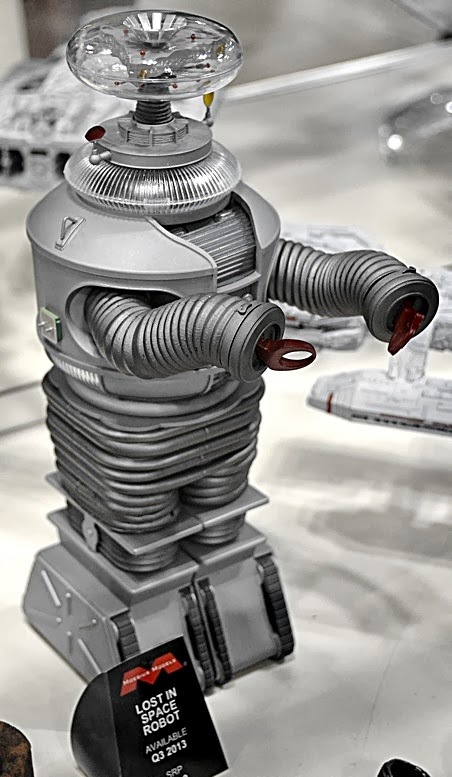 Finally, there’ll be a new 1:6 scale model (above) of the robot from ‘Lost in Space’. A companion machine to Robby the Robot, the LiS mechanoid has always suffered in that it never had a name, just ‘Robot’. It did acquire two alternative designations - YM-3 and B-9 - though neither is really authentic. In fact, B-9 is used as a designation only by Moebius. 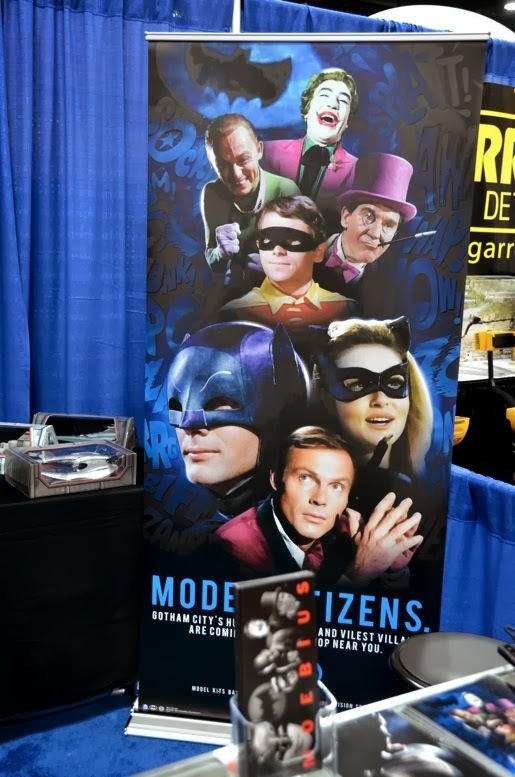 Meanwhile, 250 miles away in the town of Sylvania, to which the Toledo Collectors Toy Fair moved some years ago, the Moebius display was manned by Dave Metzner, with some of the company's new vehicle goodies. 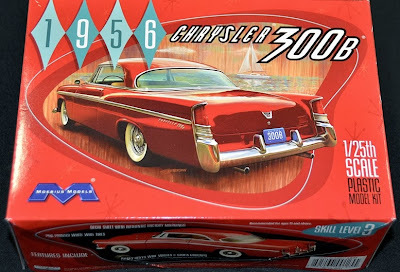 Box for the 1:25 scale 1956 Chrysler 300 (above) with an assembled model on display (below). 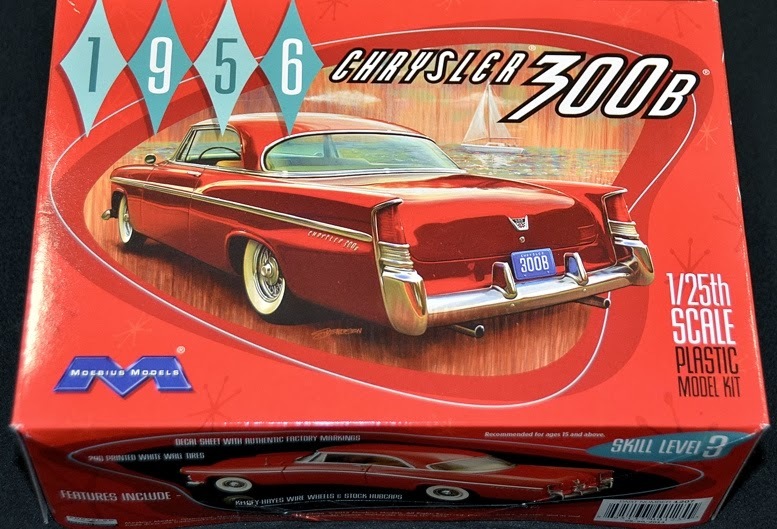 The 1956 Chrysler 300 complements the existing 1955 car, as it is a logical modification of the ’55. 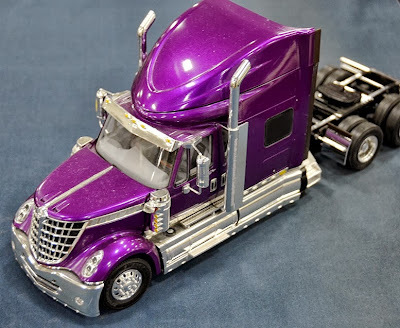 The 1:25 scale International Prostar truck (below) is based on the existing Lonestar. 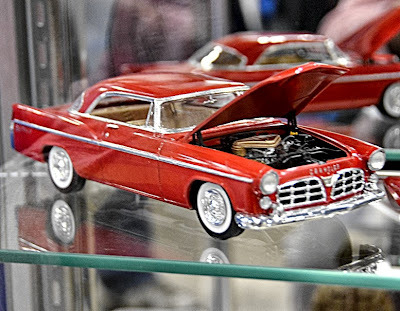 For 2014, there will be three brand-new 1:25 scale vehicle kits. These are a 1961 Pontiac Ventura, a 1965 Mercury Comet Cyclone, and a 1971 Ford Ranger pickup. None have been tooled in this precise form before. For example, AMT made a 1964 Mercury, not the ’65, and a 1974/5 Ranger, not the ’71. 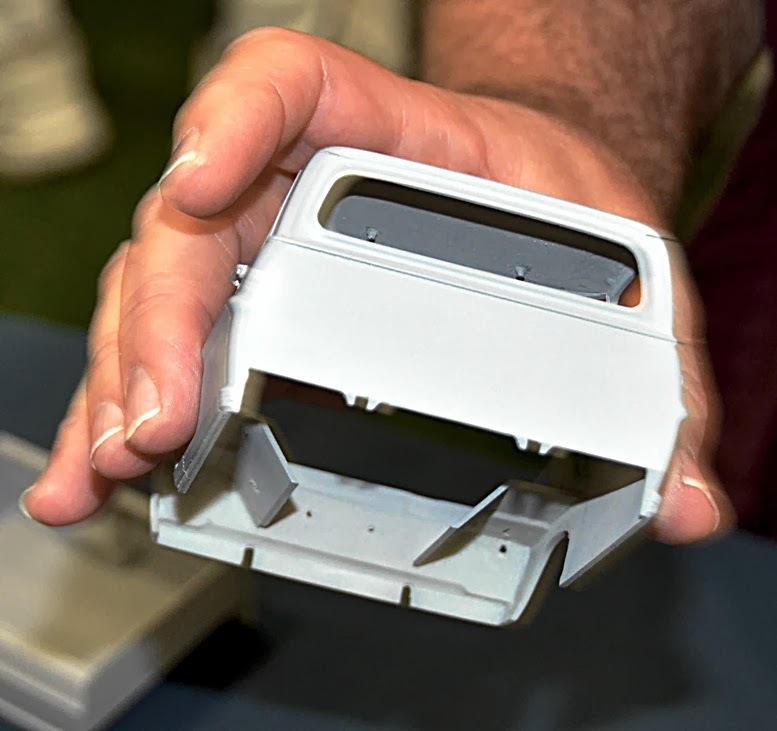 All three kits are likely to be modified into other versions and years, to maximise use of the tooling. 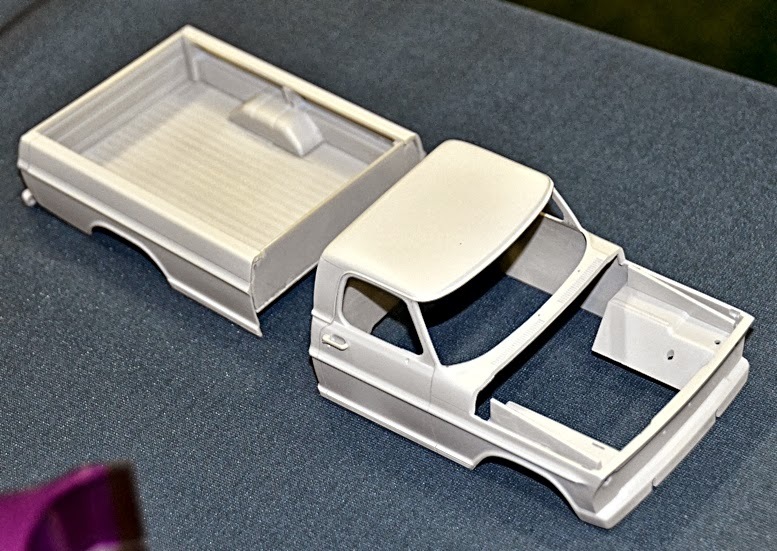 Car kits due from Moebius in 2014 (above) left to right: 1961 Pontiac Ventura, 1971 Ford Ranger pickup, 1965 Mercury Comet Cyclone. Dave Metzer’s hand reveals the cab from a test shot of the Ford Ranger. All in all it looks like a good year to come for both Moebius Models and model builders interested in science-fiction and vehicle kits. 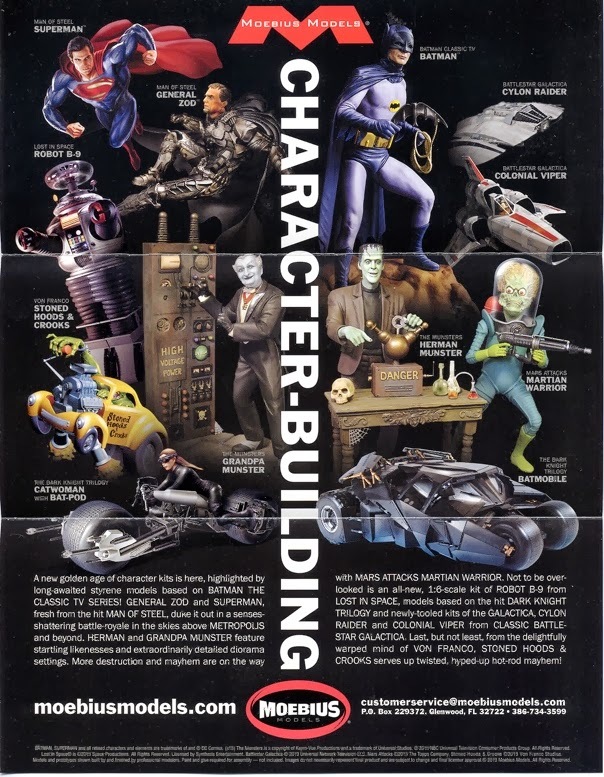 Plenty of Moebius Models here. Attractive page from a Moebius leaflet (above) showing new kits. Some existing Moebius models: Frankenstein’s monster and bride (above) and the Creature from the Black Lagoon (below). 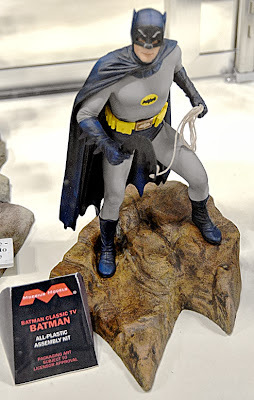 Prototype Batman figure (below) looks good atop a supplied chunk of diorama scenery. 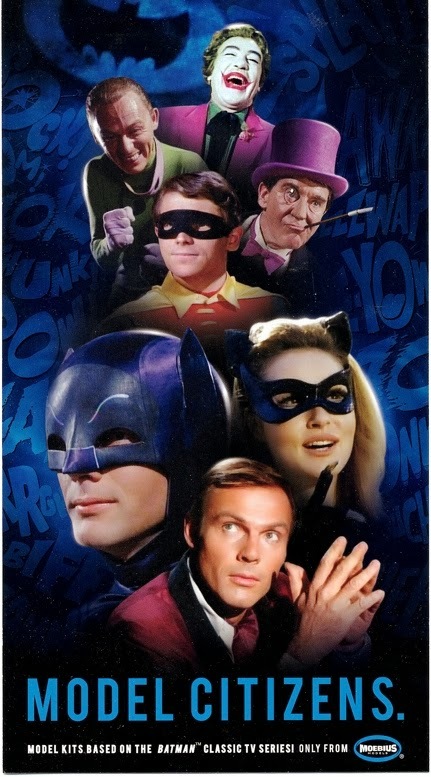 The Moebius A-list (above) from the top, actors’ names in brackets: The Joker (Cesar Romero), The Riddler (Frank Gorshin), The Penguin (Burgess Meredith), Robin (Burt Ward), Batman (Adam West), Catwoman (Lee Meriwether), and Bruce Wayne himself. 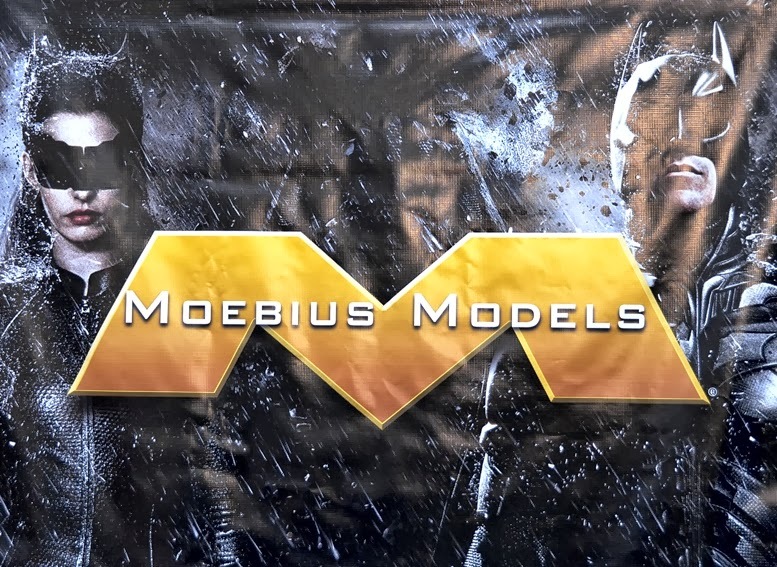 The new Moebius Models logo (above) moves away from its previous take on the original Aurora oval badge.